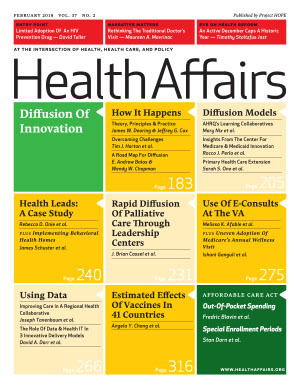 The February 2018 edition of Health Affairs focuses on the critical issue of diffusion of innovation within healthcare. With support from the Peterson Center on Healthcare, Blue Shield of California Foundation, The Leona M. and Harry B. Helmsley Charitable Trust, and the Agency for Healthcare Research and Quality, this issue takes a closer look at how innovation happens, best practices for scaling and spreading innovation, and what we can learn from successful diffusion efforts. Taking Innovation to Scale in Primary Care Practices: The Functions of Health Care Extension – Sarah S. Ono et al. Learning Collaboratives: Insights and a New Taxonomy From AHRQ’s Two Decades Of Experience – Mary Nix et al. Innovation is often lost in the huge, sprawling healthcare sector, but lessons learned are invaluable to keeping innovative ideas moving and spreading. Ono and Horton explore challenges and opportunities in scaling and spreading quality improvement innovation, including designing programs that build and sustain commitment. Dorr analyzes three large-scale healthcare delivery innovations—accountable care organizations, advanced primary care practice, and EvidenceNOW—to assess where data-driven innovation occurs and the challenges it faces. Often, the high costs and burden incurred during implementation limit organizations’ ability to address challenges. Nix proposes a taxonomy to help decision makers and funders improve how they develop and evaluate learning collaboratives. Building on AHRQ’s 20 years of experience sponsoring such efforts, Nix et al. characterize attributes, identify factors that contribute to their success or failure, and assess the challenges they encountered. Health Affairs has made a significant contribution to our collective knowledge about diffusion of innovation in healthcare. It also suggests the sector has much more to learn. One particular challenge that remains is translating this research into actions that providers, system leaders, payers, and policymakers can take to create a new standard of care. The Peterson Center on Healthcare is committed to accelerating adoption of innovative care delivery that improves quality and lowers costs. By bridging the gap between knowing what to do and knowing how to do it, we can make high-performance healthcare a reality for all Americans. The Center's entry into healthcare transformation is also the entry point for many Americans into the healthcare system: primary care.